I never imagined that I would actually do this. Almost two years ago my husband, Paul, said to me, “Hey. 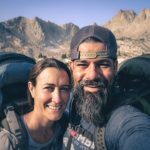 Let’s hike the John Muir trail to celebrate our 20th wedding anniversary”. I said, “Sure!” not knowing exactly what I was agreeing to. As plans were made, gear was purchased, and as the summer of 2018 approached, I only began to understand what our adventure might be like. We sat down one Wednesday night, trail maps spread all over the kitchen table, plotting the actual mileage and food drop planning for 24 days of hiking. This was the first detailed picture I had in my mind of the John Muir Trail, 11 passes between 11-14,000 ft. A summit on the highest mountain in the contiguous United States at 14,505 ft. on the actual day of our anniversary. Miles and miles of wilderness in every direction of this trail while leaving cell phones and civilization behind. The night before our trip I couldn’t sleep at all. I was worried about leaving the kids: 5 children ages 8-18 would be continuing life at home without us for almost a month. Grandparents were coming to help, but did I pay all the bills? Did I let their piano teacher know we were taking a break? Did I get dog food? I was anxiously anticipating the journey to come. What if my recently injured foot couldn’t take the daily beating? What if Paul fell and broke his leg? What if we come across a bear? Tossing and turning that whole night, I welcomed the 4am alarm when we piled our backpacks into the car. Paul’s dad drove us to Yosemite National Park to finally begin our adventure. Our plan was to hike about 10 miles a day with a few rest days (zero days) in the schedule just in case. 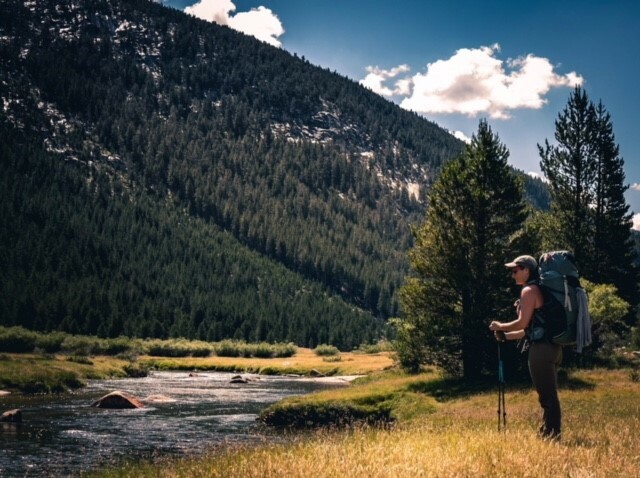 Once we took our first couple of steps on the John Muir Trail and took a breath of clear mountain air, I was ready for anything. Beautiful mountains everywhere, crystal clean stream, meadows bubbling with wildlife, every twist in the trail revealed a new landscape. Everything started off so well that first day. It was just a bit longer to our first destination, only a mile or so. But suddenly, the path went straight up, the switchbacks got steeper and steeper. I could feel my lungs gasping for breath as we trudged up the side of a mountain. I panicked a little, why was this so hard? I couldn’t breathe, the sun was so intensely hot. But Paul, looked back at me and recognized that exhausted glare in my eyes. He said exactly what he says at our 6:30am CrossFit class. “You’re fine, just do it – one foot in front of the other.” Yep. Just like a terrible long soul-crushing WOD– I could do it. I was tired, I was ready to give up (on day 1) but I could do it. Several moments during our trip, I was pushed to a point beyond what was comfortable. Way beyond that point. Heat, cold, insane step-ups, rocky descents down, heights and water crossings, unknown situations were waiting for us just a few steps beyond. But I’ve done this before. OK, maybe not 4 miles of 24” rock-chiseled steps under the blazing sun climbing the Golden Staircase – but I remembered this pain. I know what it’s like to work so hard so that every muscle in my body tingles and I might vomit. I know what it feels like to sweat through every single article of clothing, heaving heavy loads, barley able to breathe. I know when that dizzy feeling warrants a 5-minute break, so I can regroup and push on. I’ve done this before. After the first couple of hard challenges along the trail, I was more at ease. Instead of panic when I saw the next 19 days of several miles of elevation gain, I just told myself, “It’s a 24-day chipper. One rep at a time.” When my breathing got frantic and my legs were tired, I fell into that paced rhythm that I learned from the gym. When I was hot, tired, cold, hungry, I was reminded that this present pain was temporary – I would be fine. My body had been trained to do this – by CrossFit. Cindy Koch is a Mother of 5, Wife and doer of many things. She is also our Teens/Kids program director and coach, and now a mountaineer.